UiPath has seen record growth during the past year, and the fastest customer acquisition in the industry. 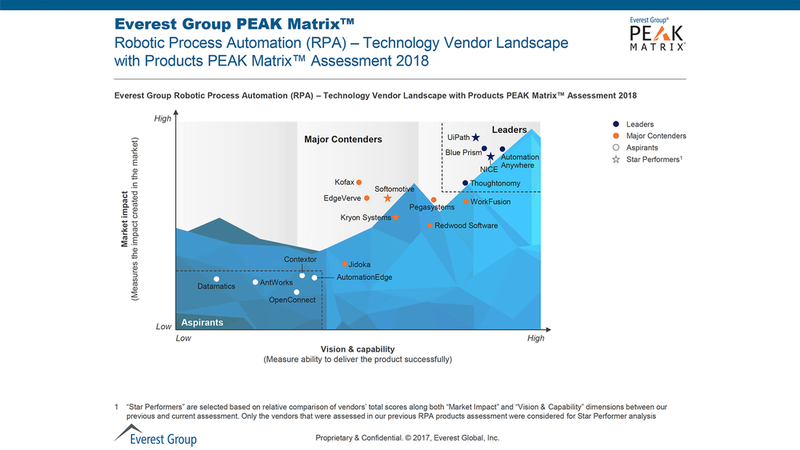 As a coronation to their success, they have been named RPA Technology Leader and Star Performer in Everest Group’s 2018 RPA PEAK Matrix™, being the only vendor in the RPA industry to receive both distinctions two years in a row. RPA vendors have been appraised for market impact, overarching vision, and product capability and support. UiPath’s total score along both “Market Impact” and “Vision & Capability” dimensions have set them at the highest point of the PEAK as the RPA leader with the biggest impact on customer value, delivered at depth and breadth across geographies and industries. If you want to read more about UiPath's momentous growth from the past year and download the Everest PEAK Matrix 2018 Report, head over to UiPath's official statement.